Anytime you lift one end of a vehicle, you should use a good set of wheel chocks for all tires remaining on the ground. 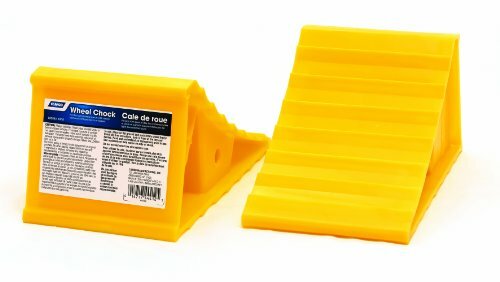 If you own a set of vehicle ramps, high quality chocks are a great companion tool to give you more stability and enhanced safety. The best wheel chocks will be light enough and small enough to store behind the seat for emergency use, and strong enough to last for years. Rubberized wheel chocks will always give you the best performance, gripping the surface they rest on to prevent sliding. Keep in mind, though, that wheel chocks are designed to prevent a tire from moving, and are not large enough or strong enough to use for other purposes. Chocks should always be used when a corner or entire axle of a vehicle is raised up using a floor jack and/or jack stands. The obvious advantage of these made in the USA red wheel chocks is their high visibility. You’ll quickly know whether you remembered to place wheel chocks behind the tires and you won’t have to spend time searching your garage for them. The 980 series are designed for use on concrete or other hard flooring, but they can also be used as emergency chocks when ideal conditions are not possible. At less than 2 pounds per set, these are the top wheel chocks for use in multiple locations or as part of a mobile mechanic’s shop. Size matters when it comes to wheel chocks, so make sure you are purchasing a set that is suitable for your particular needs. This model of Ernst chocks is designed for small to medium sized vehicles on hard, flat floors, and may not provide sufficient support in other applications. The small size is the biggest single drawback to Ernst 980s. They are built of durable rubber that provides excellent gripping power, but the 3 ½ inch width is just large enough for many truck tires, SUVs or other large vehicles or recreational vehicles. The patented design will hold back a lot of weight, but be careful to never drive over these chocks or you may bend the ribs which give them stability. DIY mechanics will have dozens of uses for these non-slip wheel chocks that are solidly built and easy to see and use. 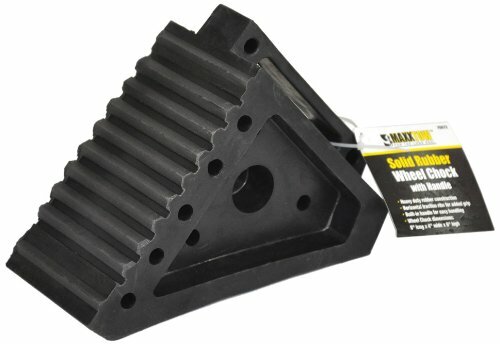 Maxxtow 70072 heavy duty wheel chocks are taller and wider than the Ernst chocks, and are molded of solid black rubber that doesn’t shift or slide on flat surfaces. Because of their heftier size, Maxxtow chocks work well for all vehicles, and have the solid weight (4.8 pounds each) for large pickups or even RVs. Keep in mind that these chocks (like others) are designed for use on relatively level ground, and you may have different results on even a mild slope or pebbly surface. The biggest negative with Maxxtow 70072 wheel chocks is the strong rubber smell they have when you first get them, although this goes away over time. Also, keep in mind that you only get a single chock per order so you will need at least two. 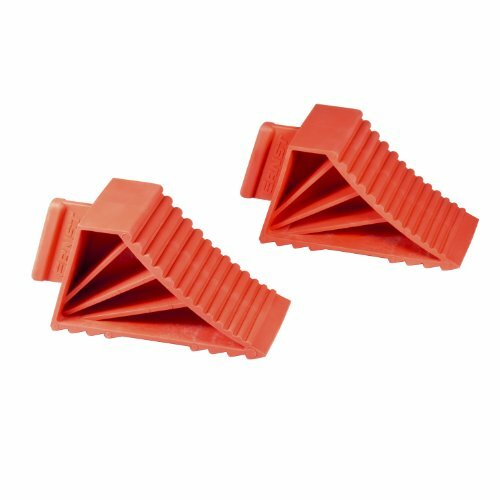 While we’re hesitant to recommend non-rubber wheel chocks, these Camcos are probably the best of the plastic-type models and are actually made in the USA. Typically priced around ten bucks a pair, they are pretty good cheap wheel chocks and much better than not having any wheel chocks at all. They are made for use with tires up to 26″ tall and come in a highly visible yellow. If you have a slicker than normal garage floor, one of the rubber options above would be a better choice since these most likely will slide.